Welcome my friend Gina . 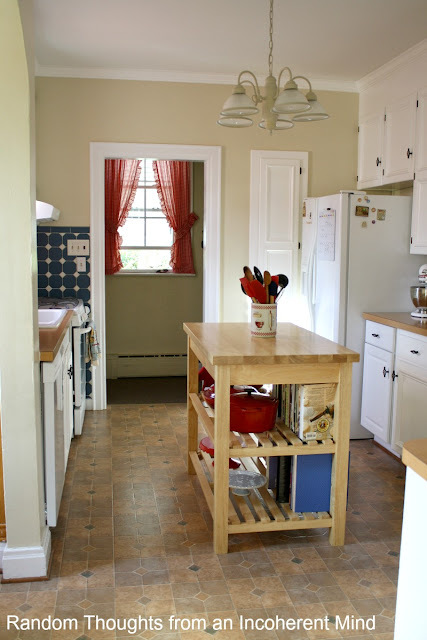 Today Gina is sharing her Cape cod charmer home tour in Utica NY. Gina from Random Thoughts here. 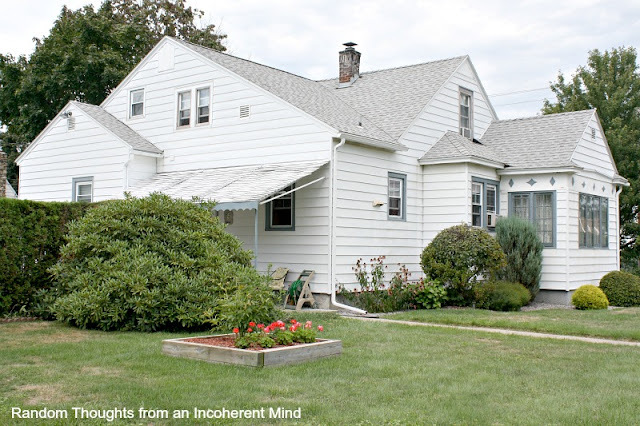 When Debbie first asked to feature my home many months ago, I giggled, then panicked. I remember saying something like, “but I don’t have one of those new, big, perfect houses that everyone has. I don’t want to disappoint your readers.” Debbie reassured me there was nothing to worry about, but I was too scared to do it. Months passed & Debbie asked me again. I told her I was still scared. Then I realized that if I was waiting for this old house to be perfect, it was never going to happen. So I told her I would do it, but in the Summertime when I’m off from work. Debbie, poor girl, asked me a third time & here I am. And yes, I’m still scared! 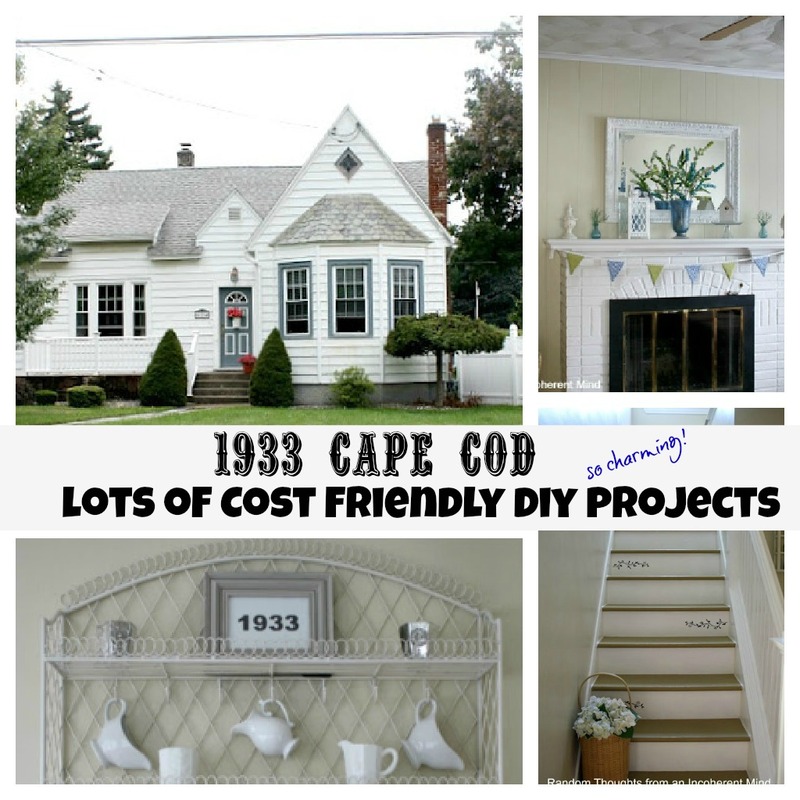 Well, we all fell in love with this one though…a 1933 Cape Cod style home. I don’t even want to tell you how well known this house is. It’s almost to the point of silliness. Everyone in the city knows it, loves it and makes sure to tell us how they’ve admired it for ages and ages. So come on in! Welcome, welcome! To the left of the front door, we have the dining room. although I’m not really sure what to call it. I’ve always thought of having a poll to decide the name of this room. To the right of the front door, we have our living room/family room. This next picture is looking straight ahead from the front door. 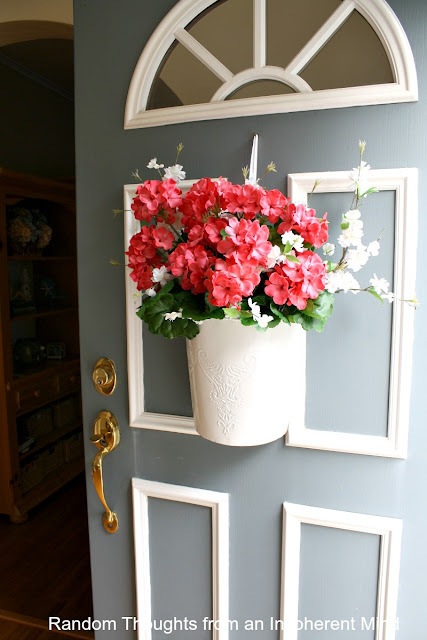 I am in the process of painting all my dark doors white. Off to the side is a coat rack. I love this coat rack. It is original to the house. Straight through the hallway is our very tiny bathroom. 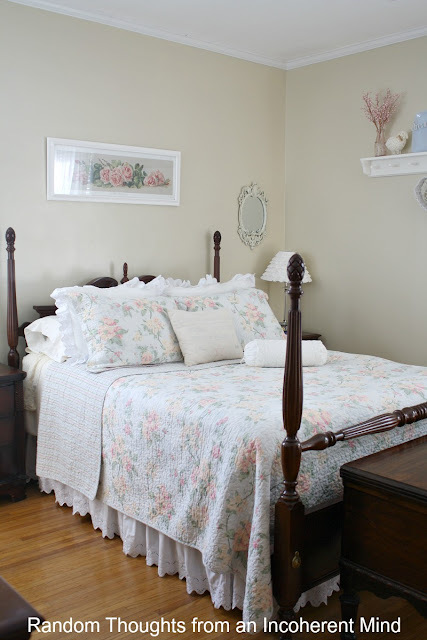 To the right of the bathroom, we have the master bedroom. Now there is another bedroom next to the master. so we’re going to stay away from that, okay? To the left are the stairs that I recently painted. but I’m thinking the world may not be ready to see any of that just yet. Next to the stairs, we have the kitchen. Here is the side & back of our house. We live on a corner lot. 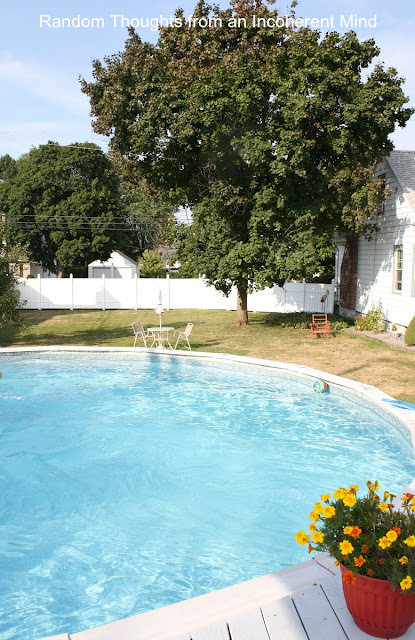 Going into the yard, here is our pool deck. 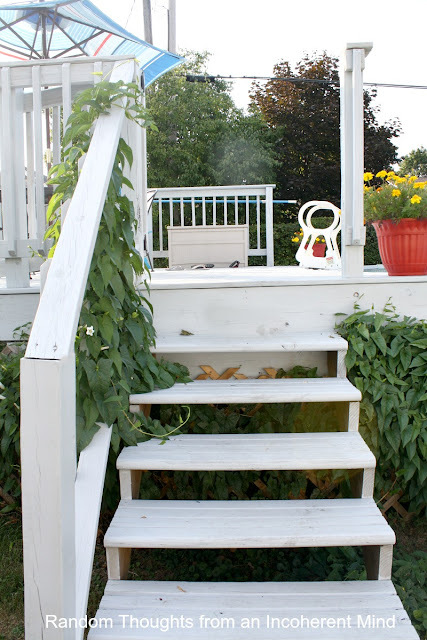 I just love how that Morning Glory has wrapped itself around my railing. Here’s a little of the pool, and some of the side & back yard. Maybe someday soon I will show you all the areas we’ve missed on this tour. Honestly, I am honored if you’ve stuck around with me this long. It may not be perfect, there’s so much more work to do, but this is where my ♥ heart ♥ is. Thank you so much for visiting my home today. I absolutely adore Gina’s home and style. Hop on over and say hello. She has wonderful crafts,recipes and randoms always going on. come back later on where Shannon and I will be starting our weekly Pinterest party. YEP, I said weekly we will get your pins on, and so will you. 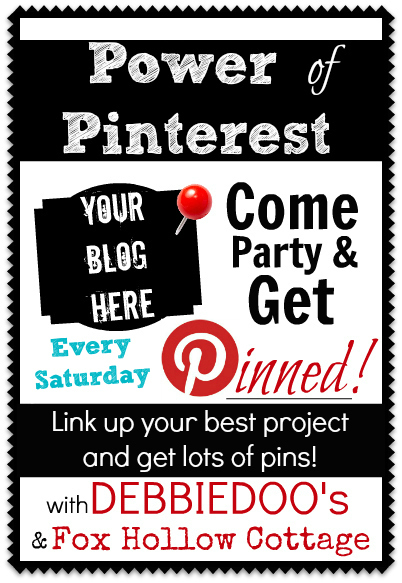 Link up your favorite project and get pinned. OH MY WORD! I love that house. 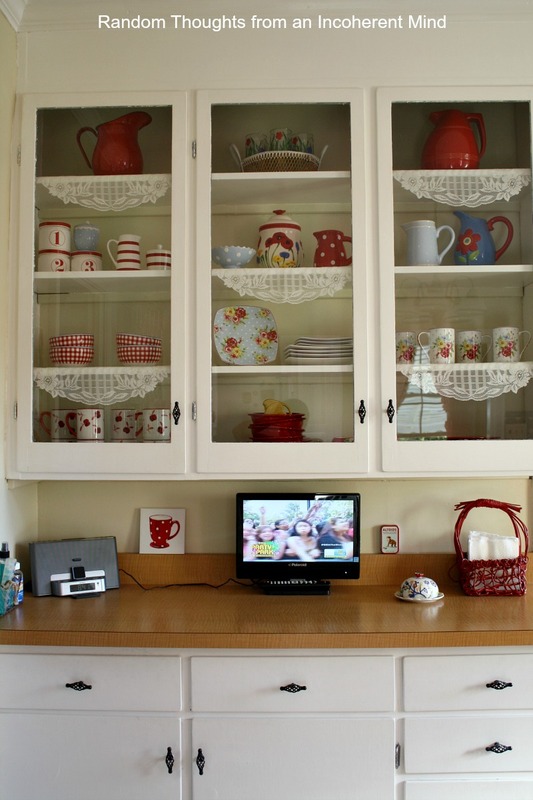 The little cubbies in the wall and all the cute character they no longer put into regular built houses! I love this style home and Gina yours is gorgeous!! All the details are amazing! Thanks so much for inviting us to tour. Thank you Debbie for this wonderful feature. I love Gina’s charming house. I could easily move in and not change a thing! 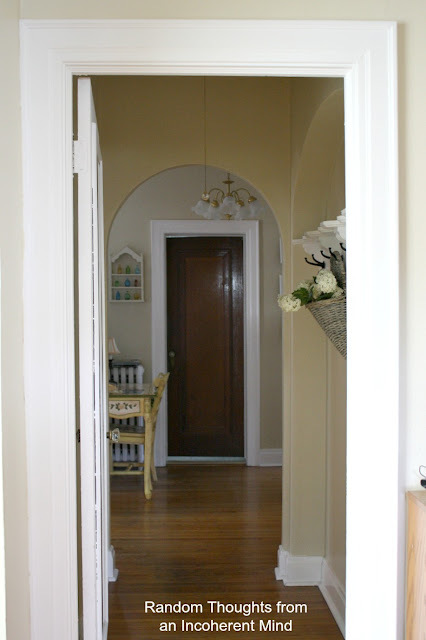 Neat touches, unique archways, great original woodwork. Love it! What a charming home! I love how the interior really compliments the exterior too. It looks like you would expect it to on the inside. I really like the stenciled stairs. I’ve never seen that done before (other than numbers) and hers is very unique. I love the old fashioned charm of the kitchen and bathroom too. Thanks for sharing her beautiful home! Gina, girl, you had nothing to be scared about. Your home is simply charming. You just don’t know how badly I would love an older home. You have decorated it beautifully and I love your cute kitchen. Wiping the drool- what a gorgeous home! Wow, Gina thank you so much for opening your doors..and letting us poke around! 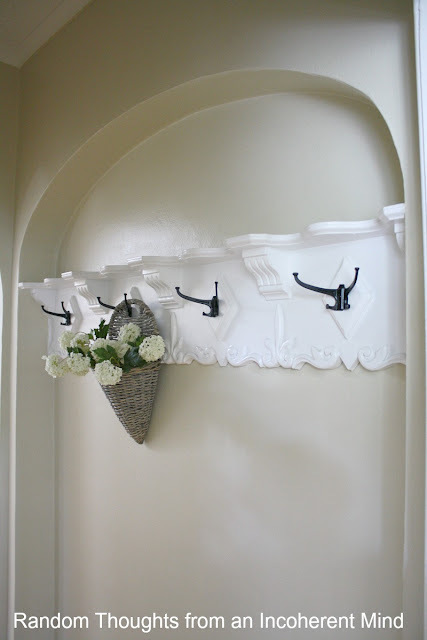 Love your original coat rack as well..too cool! Your colors you show throughout your home look wonderful together! Thank you once again! This home is lovely! It is so inviting! Thanks for sharing! Not perfect? Well it looks absolutely perfect to me! What a charming home you have, every ounce of it is so darling….decorated beautifully! What a beautiful home! I love the feel of comfort that all of the little touches add to her home! Thanks for sharing and introducing me to another terrific blogger. How sweet is that house! I am sooo glad you shared with us! What a charmer! And you have done such a great job of honoring it’s original features and charm! Hi Deb, I think this is the first time I’ve seen Gina’s home, how adorable, she certainly has been busy…love the stairs and little cubbies! I’d love to own a house like her’s, so very charming is the word that comes to mind:) Gina should be very proud! so cute! 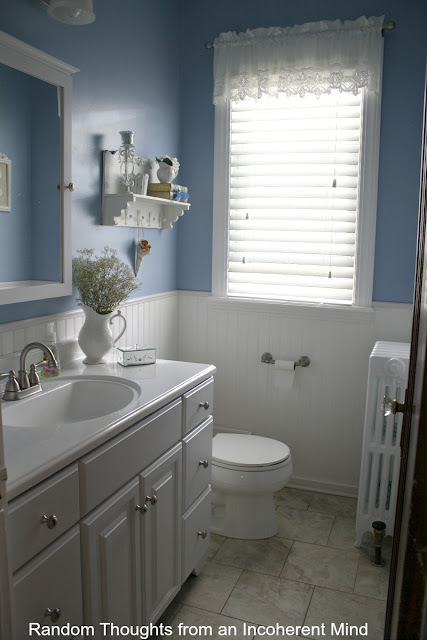 I especially like the shade of blue she used in the bathroom and that adorable cupboard above the TV. thanks for the tour! 😀 Your house is so cute, Gina! I love it. I don’t think I had seen all of these rooms before this post, and I am so happy that Debbie featured your adorable little cottage (thanks, Debbie). I love the original features. That coatrack is *to die for* Your stairs are so cute. I love how you painted the risers. You have truly given me confidence about my next project! ;P I love the creamy whites, blues and reds you have in your home. *squee* I love those colors together! How is the FP hearth coming along? I need to see if I have missed your posts about it. Back to school has been tough around here for us! 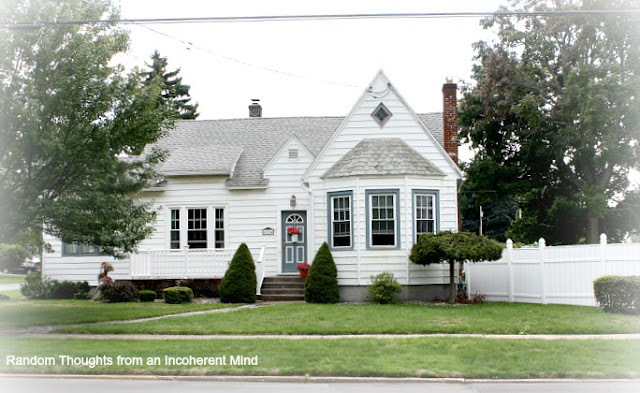 What a charming home…so much character and personality…love all the architectural detail (OH the coat rack! )…and decorated beautifully! Thanks for sharing! OMGoodness Gina has a BEAUTIFUL home!!!!! I just LOVE everything about it and it’s so beautifully decorated. What a great home tour feature. What a pretty house! I have been without my computer for a week! GAH! I am trying to play catch up now! Well Gina, you have nothing to fear – cute is cute. I’d hang out having coffee, crafting, watching everyone swim cuz I’m not putting on a suit. I enjoyed the tour and while I’m grocery shopping I’ll be thinking of something interesting to call your unnamed area. What an adorable home! 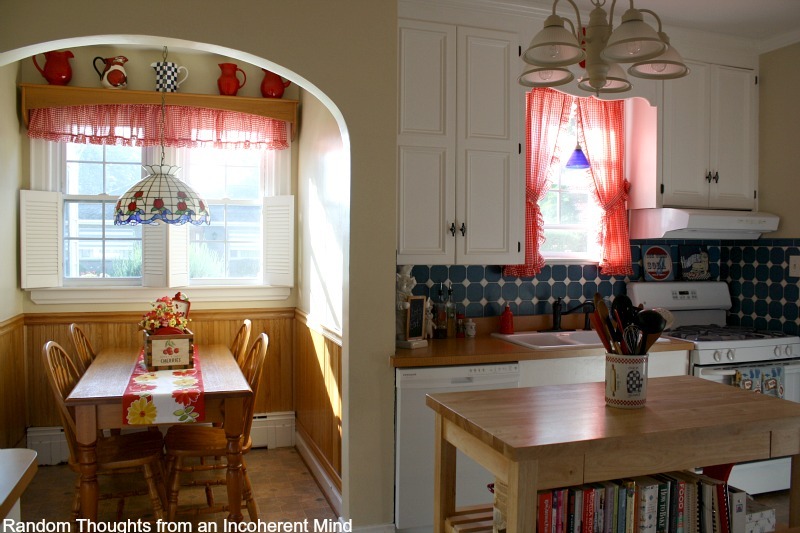 I LOVE that kitchen and dining nook!!! And the wainscoting in the bathroom is so pretty. I admit, I’m jealous of the pool. 😉 This is a great home and I can totally see why it’s where your heart is, Gina. Thanks for sharing with us today. I love it.. They really dont build them like that anymore. Every nook and cubbie has such charm.. Cute house! Love how she did the stairs! 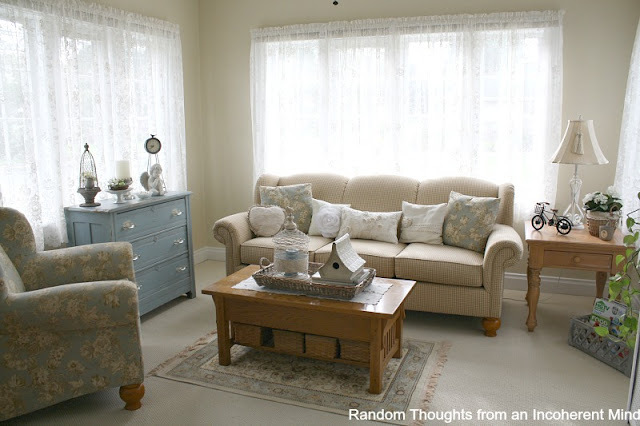 Her living room almost looks like a sunroom! Love the coat rack, too. Thanks for sharing. Hi Debbie Dear! So glad you persisted!! Gina’s home is wonderful! What a warm and inviting home. So sweet and pretty! I would LOVE to have a home like Gina’s. I have a newly built home (not big!) and would trade it in a second for an older home like that. I love Gina’s home! A Cape Cod has such charm! Gina I don’t know why you were nervous, your home is beautiful!! 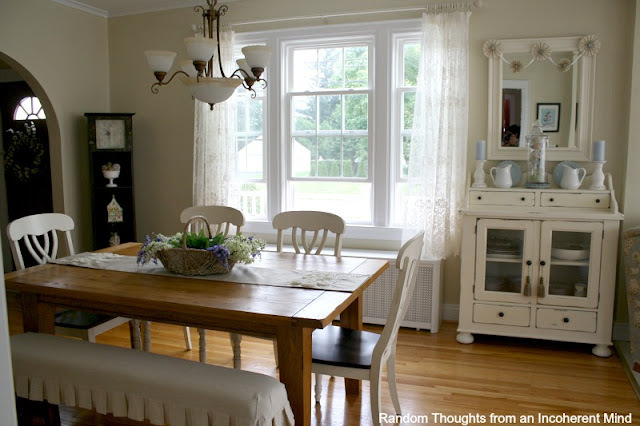 I would take an older home over a newer one any day, they’re filled with so much character!! Great tour Debbie! Oh I love Miss Gina, what a gorgeous house, honey the big old houses have nothing on you, they miss the charm and oh,,,, that original coat rack and the un-named room! Gorgeous! 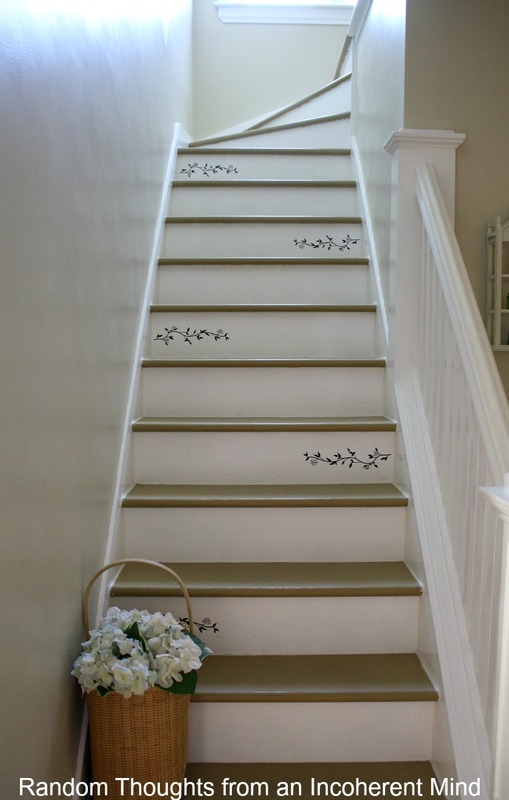 And KIDS….. CLEAN UP YOUR ROOMS SO WE CAN SEE WHAT IS AT THE TOP OF THOSE GORGEOUS STEPS! I love me some G 🙂 This house is darling, darling, darling!! I spotted a few things either she had not shown or I missed at some point. That original coat rack? Fabulous!!!! The stairs look great and I noticed the trim in the cabinets was different (and super cute!!) Happy to get the grand tour girls. Thanks!! Thank you to both of you for sharing. This home is charming and lovely. I love all the extras. By the way, my aunt has a room like that. She calls it her “conversation room”.. It always makes me smile. i am not quite sure why Gina was so hesitant…I love her house….Gina your home is beautiful and so very charming…you have decorated your home so beautifully keeping it with the tone of the charming exterior…So glad you decided to share your home with us…Beautiful. Debbie…great home feature today…I truly loved the tour and glad that Gina shared it with us! HOLY COW…this is the most DARLING house, ever. I just fell totally in love with it. She has it decorated sooo cute. I love Gina is so sweet and funny,I enjoy blogn’ with her and now I see she and her family have a most gorgeous home…I love everything and every room…can’t wait for the upstairs tour….gosh I love this kinda stuff…it’s days like today that make us realize just what enjoyment we get from blogging. Thanks Debbie and thanks Gina for blogging fun in blogland!!! Gina! It’s absolutely gorgeous and soooo charming! You and I have identical taste I think! I love every single detail…how about I come over and have coffee in your sweet breakfast nook, then take a swim? Absolutely beautiful! every nook & cranny. Your colors are soothing and flow well from room to room. love the sweet attention to detail all over the home. Oh my I love this little cottage. Her home reminds me of my Great Aunts neighborhood. So much detail and charm. Love it. Gina your home is so prettttyyyy! Love your colors. Would love to have your coat rack! 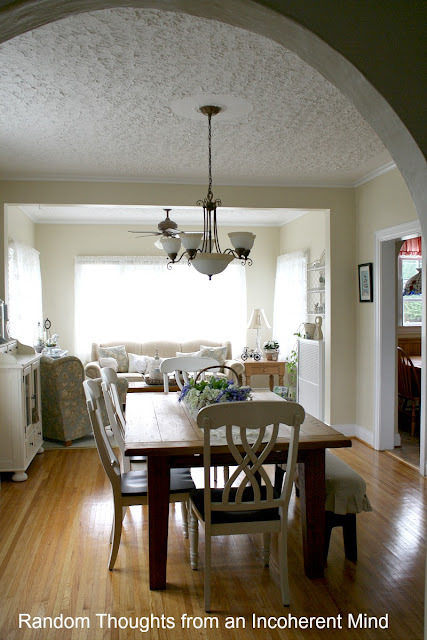 This home is charming and warm and oh, I just love it’s friendly feeling!!!! Gina, what a delight. I could move right in! Kitchen’s always call to me and your’s is just as cozy and sweet as they come!!! I really appreciate your attention to detail… beautiful details!!! Thanks, Debbie for another home to inspire us! I LOVE Gina’s warm and cozy house! I can see why she feel in love with it. It is just neat as a pin and decorated perfectly. I really loved the red touches in the kitchen and how Gina showcased the glass front cupboards with all her pretty things. Thanks for pestering her to share her beautiful home. Gina’s home is perfectly charming. Thanks, Debbie, for convincing her to give us a tour! I think Gina has an absolutely charming, cottagey looking home! I’m glad you finally relented and shared it, Gina! : ) Thanks for sharing Gina’s home with us, Debbie! Gina has a beautiful home! I adore her sitting room. I look forward to seeing her craft room someday. I remember all the details that went into redoing her bathroom. It turned out so good!!! I adore Gina’s home! So many details about it I love. On my way to her blog to tell her! Thanks for featuring her home. Love Gina and now I love her home. I had already seen some of the rooms but had missed a few things. So glad you convinced her to share! Gina’s home is as sweet as she is. It definately is a charmer. Love the built in coat rack and glass cabinets. Thanks for taking us on this tour. Just a lovely home I would be only TOO proud to share!! Wow! The yard is beautiful, the house is beautiful, the decor is lovely! You should be proud! If only I had this much space!! LOL! Thanks for FINALLY giving a tour of you charming home! So pretty and comfortable… I love Fridays for your home tours. Debbie, I love Gina’s home! You really chose a great one to feature! Her home is charming! I love it! She has decorated it beautifully! 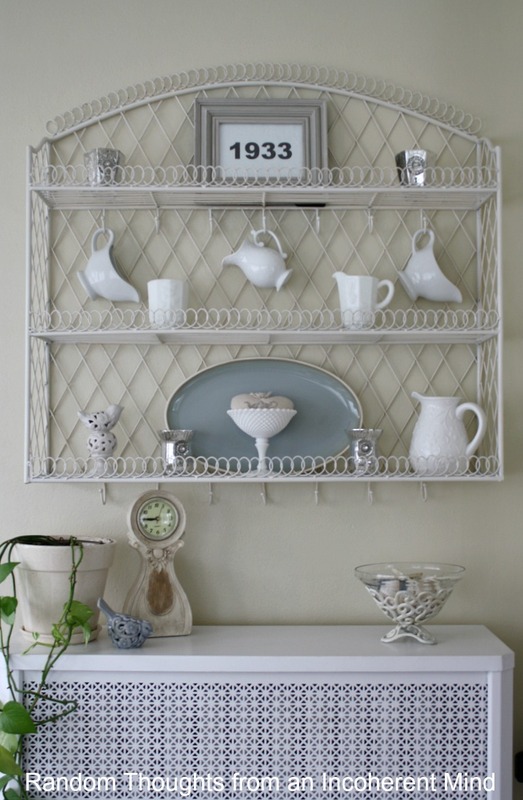 The coat rack is amazing and such a treasure! Thank you for sharing home and showcasing her talentt! I am glad that you begged. I adore Gina! your home is beautiful! so warm and inviting. you have a fabulous touch. What a darling home! I would live in this house in a heartbeat. 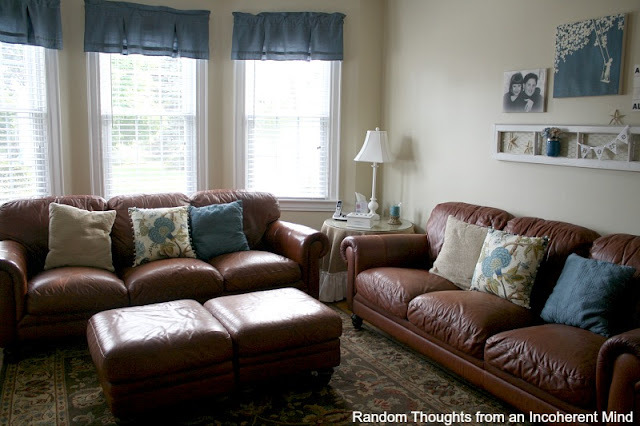 The cozy sitting room should be named THE READING ROOM! Gina, I sure am glad Debbie was so persistent … your home is absolutely charming. You must be glowing right now, having read all of the accolades above. Well deserved! What a delightful home! It is very similar to what we want ours to look like and we are having a wonderful time planning our renovation. You have kept lines and colors fresh and simple; keeping in style with the home. I particularly love the blue bathroom. One thought on the name for the room on the far side of the dining room is “keeping room”. Early New England homes often had a large room where they ate and sat around the fire and it this is what it was called. Currently our fireplace is a wretched glossy, yellow brick and we are toying with painting it white. 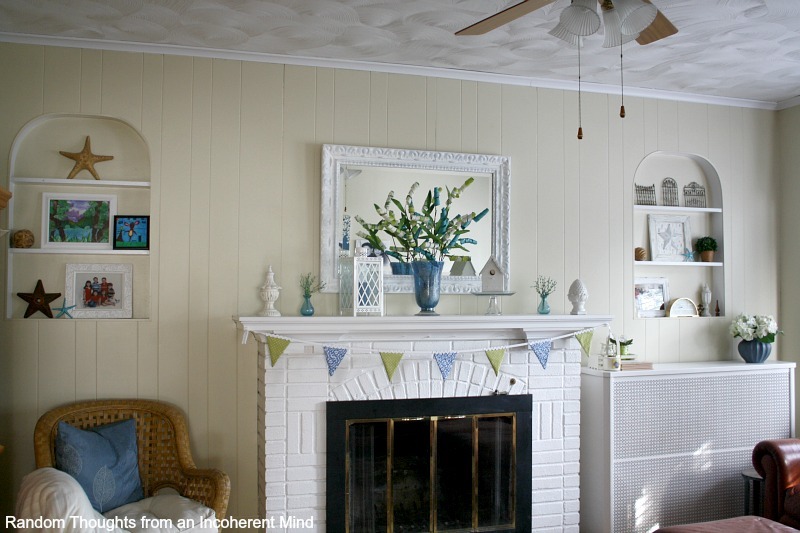 What process did you use to transform your fireplace? Great job and obviously a labor of love. Thanks for sharing. I would go on over to Gina’s blog and ask her the process of the FP:) She would be glad to help you. Thanks for stopping by today. Thank you for sharing your home with us. I’m currently rehabbing my parents Cape Cod in the far north Edgebrook neighborhood of – Chicago IL. I’m trying to stay within the scope of traditional Cape Cod interiors. You have given me some fantastic ideas so that I may be able to maintain a sense of continuity within this great historic home. Thank you! Tom Feddor, Chicago IL.